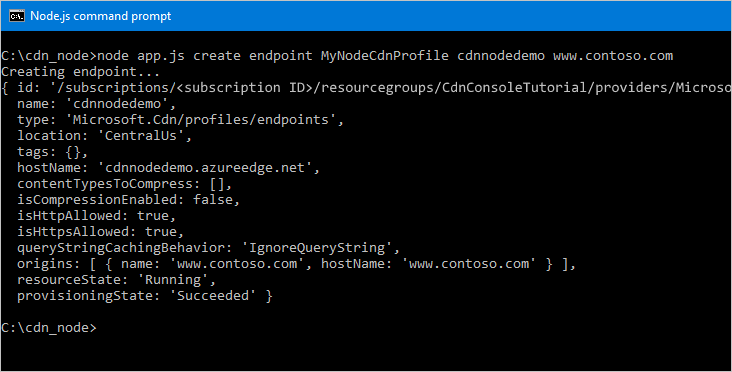 You can use the Azure CDN SDK for Node.js to automate creation and management of CDN profiles and endpoints. 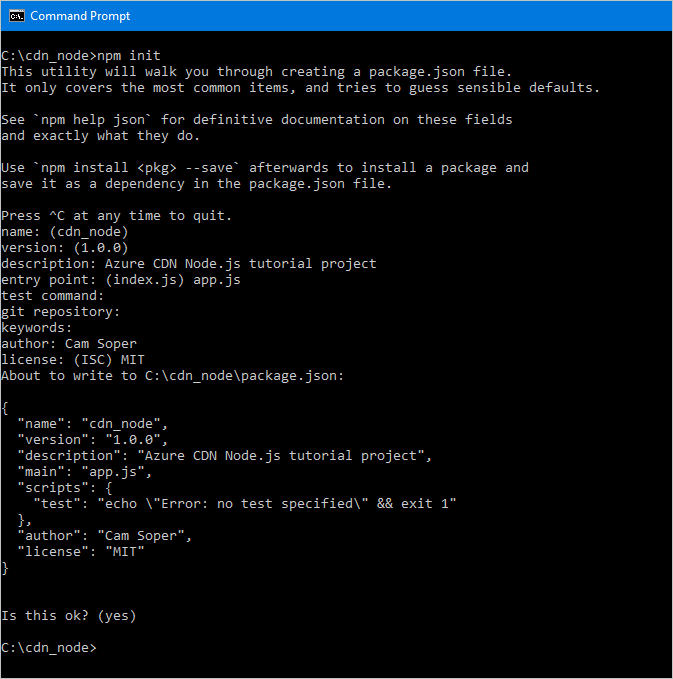 This tutorial walks through the creation of a simple Node.js console application that demonstrates several of the available operations. 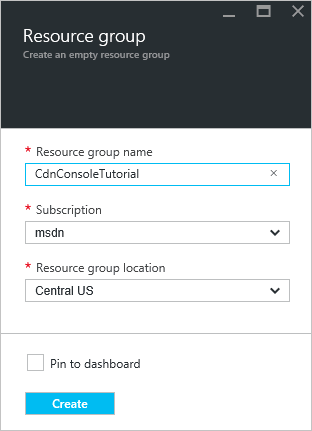 This tutorial is not intended to describe all aspects of the Azure CDN SDK for Node.js in detail. To complete this tutorial, you should already have Node.js 4.x.x or higher installed and configured. You can use any text editor you want to create your Node.js application. To write this tutorial, I used Visual Studio Code. You will then be presented a series of questions to initialize your project. For entry point, this tutorial uses app.js. You can see my other choices in the following example. Our project is now initialized with a packages.json file. Our project is going to use some Azure libraries contained in NPM packages. 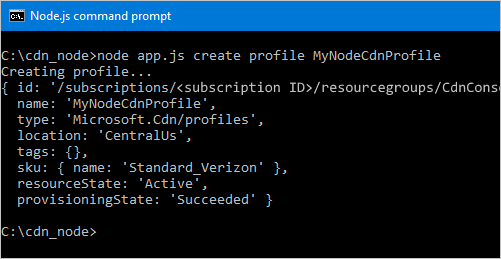 We'll use the Azure Client Runtime for Node.js (ms-rest-azure) and the Azure CDN Client Library for Node.js (azure-arm-cd). Let's add those to the project as dependencies. Finally, using your text editor, create a blank text file and save it in the root of our project folder as app.js. We're now ready to begin writing code. With app.js open in our editor, let's get the basic structure of our program written. We need to define some constants our methods will use. Add the following. Be sure to replace the placeholders, including the <angle brackets>, with your own values as needed. 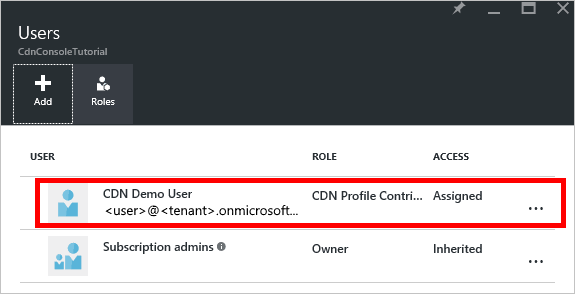 Next, we'll instantiate the CDN management client and give it our credentials. If you are using individual user authentication, these two lines will look slightly different. Only use this code sample if you are choosing to have individual user authentication instead of a service principal. Be careful to guard your individual user credentials and keep them secret. Be sure to replace the items in <angle brackets> with the correct information. 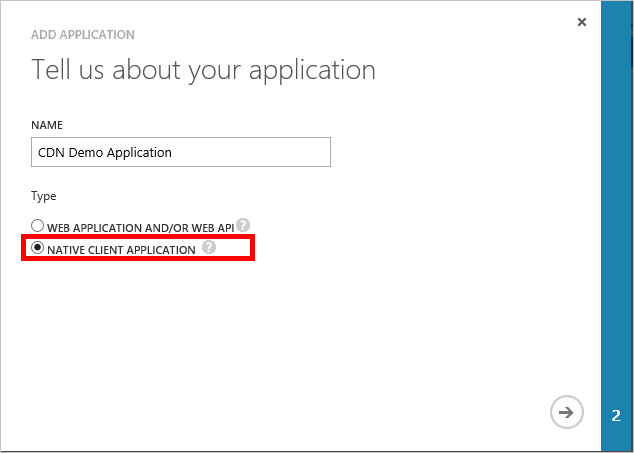 For <redirect URI>, use the redirect URI you entered when you registered the application in Azure AD. Our Node.js console application is going to take some command-line parameters. Let's validate that at least one parameter was passed. That brings us to the main part of our program, where we branch off to other functions based on what parameters were passed. At several places in our program, we'll need to make sure the right number of parameters were passed in and display some help if they don't look correct. Let's create functions to do that. Finally, the functions we'll be using on the CDN management client are asynchronous, so they need a method to call back when they're done. Let's make one that can display the output from the CDN management client (if any) and exit the program gracefully. Now that the basic structure of our program is written, we should create the functions called based on our parameters. Let's start with code to list our existing profiles and endpoints. My code comments provide the expected syntax so we know where each parameter goes. Next, we'll write the functions to create profiles and endpoints. Assuming the endpoint has been created, one common task that we might want to perform in our program is purging content in our endpoint. The last function we will include deletes endpoints and profiles. We can now execute our Node.js program using our favorite debugger or at the console. If you're using Visual Studio Code as your debugger, you'll need to set up your environment to pass in the command-line parameters. Visual Studio Code does this in the launch.json file. Look for a property named args and add an array of string values for your parameters, so that it looks similar to this: "args": ["list", "profiles"]. Let's start by listing our profiles. We got back an empty array. Since we don't have any profiles in our resource group, that's expected. Let's create a profile now. Now, let's add an endpoint. Finally, let's delete our profile. 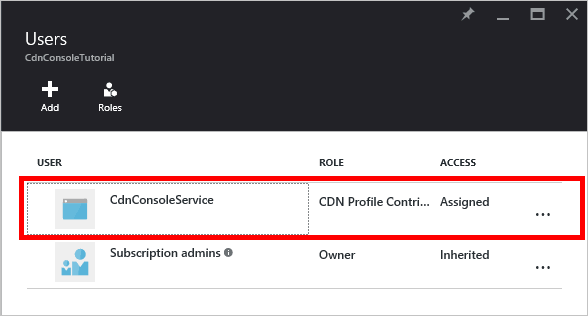 To see the reference for the Azure CDN SDK for Node.js, view the reference. 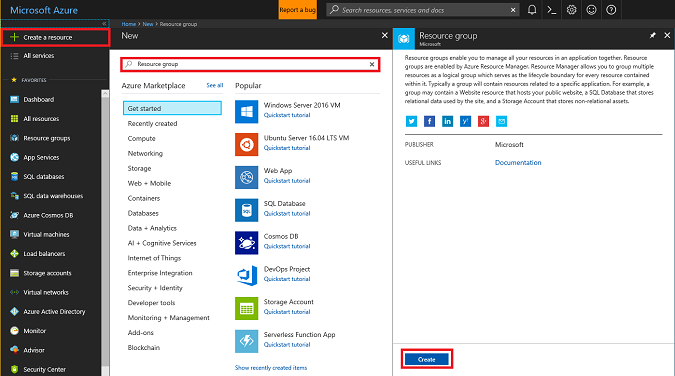 To find additional documentation on the Azure SDK for Node.js, view the full reference.